With the rise of interest in eco-friendly foods, soil microbiology has captured the fascination of farmers at all scales. A suite of organisms is invariably present in highly productive and resilient soils, but often deficient in poor soils. This soil food web including diverse bacteria, fungi, protozoa, nematodes and microarthropods can also be found in some (but not all) composts and extracted into an aqueous suspension called “compost extract.” These biotic properties of compost extracts may function in particular scenarios to prevent plant disease, accelerate soil carbon sequestration, build soil structure, and/or accelerate nutrient cycling and residue degradation. Several studies reporting efficacy in preventing plant disease and accelerating plant growth, along with compelling anecdotal evidence, have led some farmers and horticulturists to integrate compost extracts into their field and greenhouse operations. In light of mixed experimental results, more study is needed to understand indications for use and best practices for optimizing the use and efficacy of compost extracts. Meanwhile, an extensive, but financially and environmentally costly, dependence on polyethylene mulch is the current norm in organic vegetable production. This dependence is philosophically out of line with the organic movement. Prototype bio-based biopolymer alternatives may address these concerns. These biopolymers will only be allowed for organic production if their fate in diverse field conditions is full and timely biodegradation to carbon dioxide. Like mulch films, cover crops managed with minimal tillage serve to control weeds and moisture while also adding carbon and immobilizing nutrients. Mulch films and cover crops may provide the most benefit when they degrade relatively rapidly into humus and carbon dioxide. The proposed study focuses on residue degradation. Our hypothesis is that compost extracts containing more fungi and microbial predators will accelerate degradation of polylactic acid (PLA) biomulch and rye cover crop residue, especially in poor soil. Research on decomposer community and degradation rate response under different inoculant regimes will positively impact farmers at all scales in formulating best practices for mulch and residue management and increase stakeholder knowledge (e.g. extension, compost producers, and laboratories) about the regenerative potential of soil microbes. Learning and action outcomes will influence at least 100 farmers and compost producers across the North Central Region (NCR) and beyond. Stakeholders will gain knowledge about attributes of compost and soil that may have management relevance but are commonly overlooked including nematode diversity, fungal biomass, and protozoan diversity. We aim to reach farmers, including limited resource growers, through Extension bulletins, a website, YouTube videos, coverage on WIBW 13 (a Kansas television station), classes through Community Crops’ “Growing Farmers” training program, and a SARE webinar. Farmers will adjust their soil management based on the knowledge we disperse regarding soil microbiology; even if producers have been exposed to ideas of management for soil biology, our evidence-based platform will validate the perspective for hesitant farmers. Increased knowledge of ecological processes (soil microbial community and carbon dynamics) in low functioning soils amended with fresh residues will inform limited resource farmers especially as access to poor quality soil is more affordable. Poor soils and farm profitability will improve with dissemination of science-based information on the feasibility of accelerated soil quality improvement in the near term through better methods for selecting compost-based biological inoculum. Extracts from ten diverse composts were tested for chemical properties, microbial community, and lettuce seedling germination. Of these, seven organic allowable CEs were tested for Pythium damping-off suppression when used as a cucumber seed drench. Finally three CEs were used in a greenhouse experiment to test their effects when applied to three different residues before soil incorporation. Composts were selected for diversity of feedstock and process (table 1). Municipal sewage sludge (Biosolids) and an immature feedlot compost (ACN Inwood) were included because products like these are applied to many crop acres, despite their exclusion from certain definitions of compost due to their immaturity, such as those of USDA Organic guidelines. Water and dry matter content was determined for each compost. CE was produced by kneading 100 g dry equivalent of each compost in a 400 µm nylon mesh bag with 1000mL total water. No further filtration was used and any sediment was resuspended before use in all tests and experiments. Nutrient analysis and other chemical properties were analyzed by Ward Labs (Kearney, NE). Several microbial measures of CE were tested. Total microbial biomass was estimated using Fatty Acid Methyl Ester extraction (FAME) (Grigera et al., 2007), the Soil Microbiometer® system, and a “qualitative assessment” by direct microscopic observation according to the method of Dr. Elaine Ingham. Total bacterial and fungal estimates were made by direct microscopy and FAMEs. Correlations were calculated among methods attempting to measure the same microbial parameter. Nematodes were counted by sugar centrifugation/extraction and active protozoa were counted by direct microscopy. The three composts used in the greenhouse experiment were tested for total bacteria, fungi, protozoa and nematodes by Earthfort Laboratories (Corvalis, OR) using their “Advanced Biology Package”. Elaine Ingham’s qualitative assessment method, as taught by personal communication and training as well as online classes found at https://environmentcelebration.com/courses/life-in-the-soil/, to our knowledge is not currently described in scientific literature. It is however widely communicated and adapted in the community that is most enthusiastic about compost tea and CE. The method as applied to CE is to mount one drop of the CE on a glass slide with 18×18 mm cover slip, observe 20 fields at random under 400x magnification using a compound microscope with abbe condenser and record the length and width of all fungal hyphae, noting their color and presence and arrangement of septa. Count all active protozoa. Flagellates, ciliates, and amoebae are recorded separately. Testate amoebae and naked amoebae can be distinguished easily, but they are reported together. When the undiluted CE was too “thick” to discern structures, it can was diluted to 50% original concentration. To count bacteria, extract was diluted 1:1000. Bacteria are counted at the same magnification in 20 randomly selected fields as before. Extrapolation of observed organisms is calculated according to the following assumptions: one drop=0.05mL, the area of one field of view is 1/2038 of total area under the 18×18 mm cover slip, the sample occupies exactly and only the area beneath the cover slip, the density of fungi is 3.33g/cm3, average mass of one bacterium is 2 picograms. A phytotoxicity assay was performed using lettuce (Lactuca sativa var. Grand Rapids) in a completely randomized design with four replications. Ten seeds were germinated in petri dishes on 15 cm filter papers moistened with 3mL of each CE and a water control. Number germinated were recorded at 24, 48 and 72 hours and radicles were visually assessed as either stunted or not stunted compared to water control. Pythium-infected seed mix was prepared by mixing a culture grown on agarose from six 15 cm petri dishes into 0.03 m2of a 70% peat 30% perlite media which was completely saturated with water and incubated at room temperature for one week. Three flats with 50 cells each were filled with this infected media and sown with cucumber (Cucumis sativa var. Marketmore ’76) seeds soaked in each CE (excluding Biosolids, ACN Inwood, and Mountain Magic) in a completely randomized design with 16-20 replications. When half of the seedlings had a second true leaf beginning to develop, seedlings were scored as healthy or diseased based on presence of lesions at the base of the stem. Pairwise comparisons were made of the ratio of healthy to diseased/dead seedlings among CE treatments using Fisher’s exact test R software (version 3.4.3.). In a randomized complete block design with six replications we simulated spraying CE on crop residue before soil incorporation to test effects of residue, CE and their interaction on lettuce growth. Three CE were selected according to criteria in table 2. The treatment structure was a two factor full factorial with five levels per factor. CE treatments (Home Worms, Soil Dynamics, and EKO compost extracts, a water control, and a urea positive control for N addition) were applied to residues (alfalfa [11.2 Mg/ha], oat straw [4.5 Mg/ha], wood particle loaded PLA mulch [3.8 Mg/ha], geotextile, none) at standardized N rate of 3.36 kg N/ha. This was achieved by spraying water onto one pot’s measure of each residue and weighing to determine the mass of spray held by each type of residue, coefficient of variation was less than 20% for was residue. We diluted each extract to a rate that would supply the target N rate based on the water holding of each residue. The resulting rates ranged 5130-5660 L/ha of diluted extract, if the same rates were applied in a filed setting without dilution, rates would range from 2345-5660 L/ha. After spraying, residues were incorporated into a steam pasteurized sand/soil/peat/vermiculite blend in 4” square pots. Lettuce was sown two weeks after incorporation. Soil nitrate (Ward Laboratories, Kearny NE) and aboveground dry weight was measured 42 days after planting. Analysis was performed by anova using the dplyr package for R software (version 3.4.3.). CE was integrated into the treatment structure of a larger field project at two locations (Lincoln, NE and Scottsbluff, NE) evaluating factors leading to degradation of mulch membranes. In a randomized complete block split-split-plot design experiment, Bio360® and a prototype PLA/wood particle mulch (3M company, Minneapolis, MN) were applied to the whole plot, mulches were either removed or incorporated at the split-plot level after growing a crop of sweet peppers, then the split-split-plot received treatments of compost, CE, fallow irrigation, cover crop, all of the above (kitchen sink treatment), or no amendment. CE was applied in the fall of 2017 at the time of mulch incorporation, as well as in the spring and fall of 2018 before and after a crop of sweet corn. From the mulch recovered in 2017, squares of known weight were packed into litter bags with soil from respective plots and buried in all plots under the ‘mulch incorporated’ treatment. Eight bags were incorporated in each split-split-plot so that two bags will be collected at four sampling events (Spring ’18, Fall ’18, Spring ’19, and Fall ’19). One is for lipid extraction for FAME analysis, the other is for mass loss. Mass loss was determined in Spring 2018 by washing and drying recovered mulch fragments. In Fall 2018, mulches were too fragile to wash thoroughly, so mulch mass was determined by combusting dirty mulch samples. Mass before and after combustion was recorded and mulch mass was calculated using the ash fractions of pure mulch and pure soil by the following formula. In the course of extracting lipids from soils containing fragments of our biodegradable mulches consisting of the MaterBi polymer (Bio360® mulch), we discovered that a chemical called “1,4-Benzenedicarboxylic acid, dimethyl ester” also known as “Dimethyl terephthalate” was extracted and detected in large amounts along with the FAME lipids. This project helped make considerable progress towards using the presence of this molecule in soil extracts as a method for detecting very small amounts of the biodegradable polymer in difficult samples such as soils or composts. Grigera, M.S., Drijber, R.A., Wienhold, B.J., 2007b. Increased abundance of arbuscular mycorrhizal fungi in soil coincides with the reproductive stages of maize. Soil Biol. Biochem. 39, 1401-1409. The Biosolids and ACN Inwood materials were immature as indicated by pungent odor and high ratio of ammonium to total N (14.8% and 9.4%, respectively). Their low C:N ratio (5.9 and 9, respectively) indicated that they likely did not meet initial feedstock mix C:N ratio of 25-40:1 as required for organic use (7 CFR 205.203(c)(2)(i), USDA, 2000). 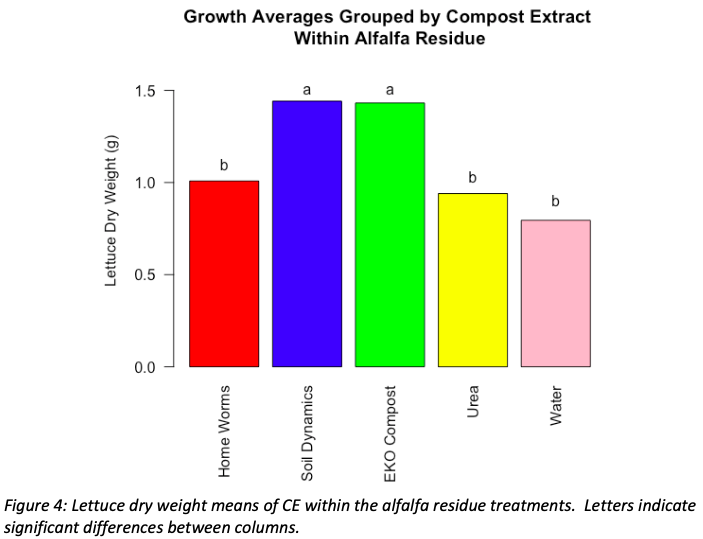 Results from these CE are not reported in table 3 because they are outliers that do not represent composts typically selected for use in making compost extract. Table 3 demonstrates the remarkably wide range of plant nutrients present in CE made from equivalent dry mass of different composts. Composts are known to vary greatly, and this research confirmed that their extracts are similarly variable. The chemistry of the solid compost closely matched that of its CE (data not shown). As with chemical makeup, CE varied dramatically for microbial content (table 4). Moreover, the method used to estimate microbial parameter had a strong influence on the result, for example Wiggle Worm compost had the least total FAMEs (biochemical marker for microbial abundance), but the greatest biomass estimated the Soil Microbiometer® system. Our data can afford a “quick and dirty” estimate of agreement between methods that presume to measure the same parameter. Table 5 outlines R2values between pairs of measurements. Microscope count and FAME agree fairly well for bacteria and total biomass, but poorly for fungal biomass. 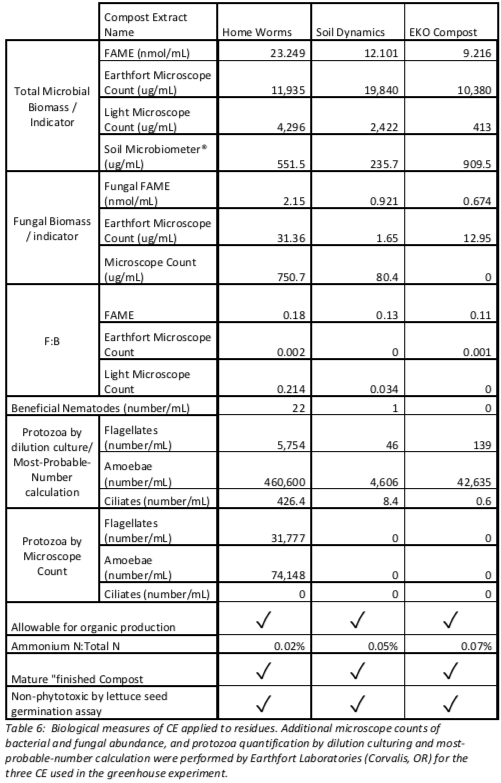 The Soil Microbiometer®, a system designed to measure soil microbial biomass, did not correlate well with FAME or microscope estimates of CE microbial abundance. A correlation matrix was created comparing all measured dimensions. This relatively small sample of ten composts does not provide a robust data set to make broad inferences on related characteristics of compost. However, it is sufficient to show that any such inferences may not be useful when evaluating an individual compost for a specific purpose. This correlation matrix can be found below. 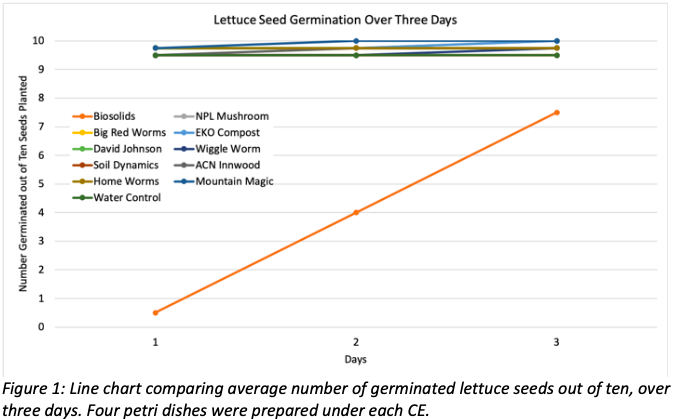 Only municipal biosolids slowed lettuce seed germination (Figure 1), and both Biosolids and ACN Inwood markedly slowed root elongation, with all radicles stunted compared to water control. These two composts had the greatest proportion of their total N present as ammonium, as well as relatively high CO­­­2­­production when dried and rewetted, which are indicators of immaturity. They were excluded from further trials. This germination test may be one of the most practical and speedy analyses for compost extract quality. It can be done inexpensively anywhere, and it is sensitive to compost characteristics that indicate immaturity. Even though we used Petri dishes and filter papers, similar results are expected by using plastic bags containing CE-moistened paper towels. Home gardening or classroom settings can easily to compare CEs to one another and to water. Compost extracts that result in lower germination or slower root elongation than water are probably immature, or possibly contain a persistent herbicide such as picloram, which has been reported occasionally. 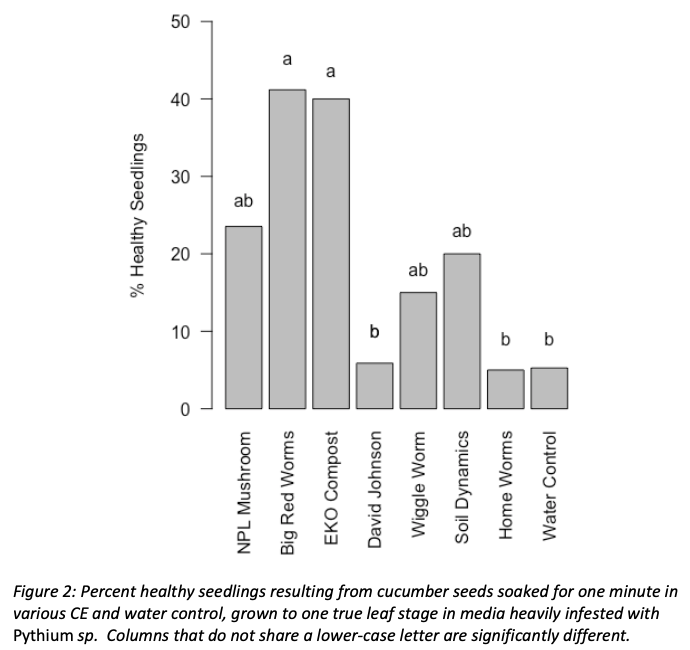 David Johnson, Home Worms and the Water control were significantly less suppressive than Big Red Worms and EKO Compost (figure 2). This result is contrary to the expectation that more fungal biomass as observed by microscopy would favor suppression, David Johnson and Home Worms CE stood out among the rest by the microscope qualitative assessment as the two composts with the most beneficial fungi, as judged by darkly colored, wider diameter hyphae with evenly spaced septa. These results might suggest that CE with abundant fungal hyphae are unlikely to suppress Pythium damping-off. Another conclusion could be that using organic allowable CE with nursery seedlings is unlikely to hurt, and likely to help with damping-off. This would run contrary to the recommendation to keep nursery seedlings as aseptic as possible by avoiding compost in controlled environments. Methods for screening composts for pathogens or pests were not investigated in this project, but would be useful in controlled settings to maintain caution while introducing compost extract. Biological characteristics of the three CEs selected for the greenhouse experiment are presented in table 6. 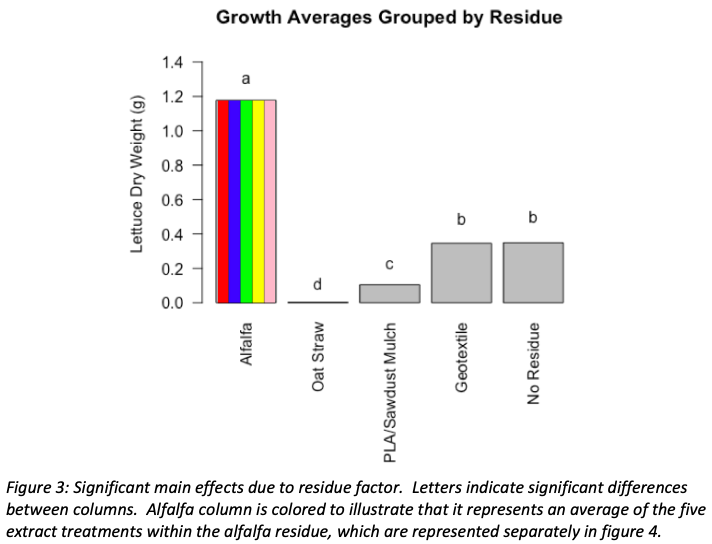 Residue had significant main effect on lettuce growth (figure 3). Compared to water and geotextile controls (0.340 and 0.337 g dry, respectively), yield increased due to N-rich alfalfa (1.12 g dry), and yield decreased due to C-rich PLA/wood mulch and oat straw (0.102 and 0.002 g dry). A contrast comparing yields under urea versus all other CE in non-alfalfa pots was significant, urea treatments produced slight yield increase in these residues. A significant interaction between CE and residue affected lettuce yield. CE had no effects on yield in all but the alfalfa residue. Within the alfalfa residue, there were significant yield increases under the Soil Dynamics and EKO Compost CE (both increasing yields equally, by 53% and 80% relative to water and urea, respectively). Home Worms, Urea, and Water were not significantly different from one another (figure 4). There were no significant differences in nitrate concentration due to any CE. Among residues, only Alfalfa resulted in soil nitrate concentration above 1 ppm. Alfalfa-amended soil nitrate averaged 26.3 ppm at harvest. Yield and nitrate results suggest N dynamics to be a process strongly influencing lettuce growth in this experiment. The significant contrast of urea versus all other CE in non-alfalfa residues further support N limitation in non-alfalfa treatment combinations. Urea was applied at the same low rate of total N as extracts, but available N would be increased under urea. Yield differences due to CE within the alfalfa residue cannot be explained by N dynamics with our data, it is possible that CE influenced N availability during the growing period as we only have nitrate concentration at time of harvest, or it could be that some other mechanism is at play effecting lettuce growth. We were interested to see whether the abundant predators and fungi in Home Worms would overcome the expected nutrient immobilization due to the high C residues, oat straw and PLA/wood mulch. Protozoa and nematodes are known to accelerate nutrient mineralization by consuming bacteria and fungi and excreting plant-available nutrients. All three of our CE inoculations seem to have failed to mitigate N immobilization, and did not increase lettuce growth under these residues. Furthermore, when applied to the relatively uncolonized environment of the steamed greenhouse mix alone or with inert geotextile, no CE had any inoculant effect leading to increased lettuce growth. Our expectation of increased lettuce growth due to more fungi and predators (protozoa and nematodes) as measured in the “Home Worms” CE, was not confirmed. Rather both CE we expected to contain less desirable biological traits increased growth by 53% over the urea N control. At the time of this report, CE has had no significant effect on mulch degradation at either location. At Lincoln, NE sweet corn yield was not affected by any treatments, and at Scottsbluff, NE yield was increased by compost and the ‘kitchen sink’ treatment which included CE. There was no significant difference between yields under compost and ‘kitchen sink’ suggesting that CE was not influencing yield in the ‘kitchen sink’ treatment, and suggesting that increased yield at Scottsbluff was driven by solid compost application. We were able to collect a data set that, with a few further additions, will provide a calibration curve to relate the quantity of dimethyl terephthalate detected to the amount of MaterBi plastic in soil, sediment, or compost samples. The methods used to prepare and analyze these samples (methanolic KOH/hexane extraction, analysis by GC/MS) are already in use in several commercial laboratories, this knowledge could easily translate to an affordable and accessible test of persistence of this particular polymer in diverse settings. CE and compost tea generate a great deal of interest in popular press and social media. The concept of restoring beneficial life to soil and plant surfaces resonates with those scientists, farmers, and gardeners who strive to connect with the fascinating ecosystem of life found in soil (Puigde la Bellacasa, 2014). There is however a profound divide between popular suggestion and research results in this area. Our research aimed to characterize a group of compost extracts and explore whether any attributes emerged as predictive of their effect at small application rates on Pythium suppression or lettuce growth. Also, one CE was applied to biodegradable mulch and its effect on mulch mass loss and sweet corn yield. Our understanding of soil and compost microbes is strongly affected by the methods used to evaluate them. We show that CE is highly variable both chemically and biologically, andthat available methods for estimating microbial parameters of CE do not agree closely with one another. CE remains unpredictable, it often produced neutral results, but we also found meaningful benefit. Other work has found the same while also occasionally reporting negative outcomes with CE. This work did not observe any negative results regarding disease prevention or plant growth. We failed to find, in this work or in the literature, any dependable predictors of CE efficacy for any particular use. This work showed that, at least in controlled environments, CE can influence crop vigor and the effect is unrelated to disease or nutrient addition. Based on our results from application of CE to alfalfa residue, further research and on-farm experimentation is warranted for use of CE as an inoculum to fresh green manures at the time of soil incorporation. Consultations: Big Red Worms owner Jeremiah Picard consulted on experimental design and gave me first look at some of his compost extract promotional materials to ensure accuracy. Doug Garrison, a rancher of grass-finished beef consulted on production and application of compost extract to range. There is a possibility of running some kind of on-farm trial that would be documented enough for a compelling case study, but whether it is executed to these standards or not Doug is certainly motivated to apply compost extract while rotating the cattle. Curricula, Factsheets, educational tools etc. : Three posters presented at three conferences (Our Farms Our Future but SARE and ATTRA, The American Society for Horticultural Sciences (ASHS) conference 2018, and the Great Plains Growers Conference) describe the results of this project. The ASHS poster is available with an audio supplement at <http://www.soilbiology.tech/ashs-2018-poster/>. Published press articles: The American Society for Horticultural Science (ASHS) joined eOrganic to offer a contest looking for five extension articles to be peer reviewed and published through eOrganic (a branch of eXtension.org). A submission summarizing the finding of this work won me reimbursement for travel and registration to the 2019 ASHS conference in Las Vegas. The article will contain chiefly background and conclusions, and it will link to a more in depth, but still narrative and approachable article hosted on the web page of the laboratory of Samuel Wortman. Webinars, Talks, Presentation: I presented a Lunch and Learn at RDG Engineering and Design firm describing global nutrient cycles and the magnitude of human impact on them, followed by a description of the (at that time) just beginning greenhouse experiment and its research objectives. I presented the results of this project including the variability among compost extracts and their effects on lettuce growth in the greenhouse when inoculated on crop residues at three events: The Community Crops Growing Farmers Training Seminar in April 2018 (Lincoln, NE), The Nature’s Best field day Aug-2018 hosted by Nature’s Best (Innwood, IA), and also at the Minnesota Organic Conference in January 2019 I presented two one-hour talks: one covered the mulch results of this project, and the other covered experimental design and statistical concepts using this project as a case study (St. Cloud, MN). Field Days: The Nature’s Best event in August 2018 was split between field touring and indoor workshops. I participated in the tour commenting on the evidence (or lack thereof) that various inoculant products impact the soil microbial community, which is a central question of this project. In teaching or seminar settings, the soil health/microbiology/food-web has steadily attracted interest and caused producers to adopt new practices. The segment of this movement that favors the use of compost teas and extracts is largely driven by anecdotal successes and a rejection of ‘chemical agriculture’, which may alienate some producers. This project has clearly described some surprising growth responses, and confirmed disease suppression effects, attributable to very low rate application of compost extract. It failed to support any proposed tests for efficacy of compost extract. As these results are communicated in the future, producers who may have been repelled by the language of marketing promising a silver bullet in compost teas and extracts, may now be more willing to take these more cautiously optimistic ideas and try them in their unique settings. When adopting a more adaptive IPM strategy based on high monitoring and minimal application of pesticide, it can be useful to have a “gentle” option for maintenance or when pests or diseases are present at economically irrelevant levels. Compost extract can be such an option, for example in nursery crops susceptible to Pythium, maintenance applications of fungicides may be avoided, while a known suppressive extract could reduce incidence of infection and allow more powerful control to be used as needed. My attitude toward compost extract is tempered. I expected that microfauna could mitigate some of the nutrient immobilization effects of soil-incorporated high C:N residue. This is a highly reinforced and trusted myth in certain circles, which may be true in other settings. However, the results of this experiment showed that none of the compost extracts influence plant growth in soils with fresh high C:N residues, however in the case of low C:N residue (alfalfa) it was compost extracts with fewer microfauna that resulted in increased plant growth. To deploy compost extract on a broad scale will typically be a low-cost strategy, and certainly sustainable in that the resources to produce it are wastes and locally available in any agricultural setting, however the results are variable and this work has vexed my prior expectations of which metrics would predict efficacy of compost extract. Through this project I gained a keen interest in applying formal experimentation to sustainable agriculture ideas. Before I started graduate school and this project, I accepted a few leaps of faith in ‘sustainable applied soil science’ that are regarding the concept of managing soil microbes and soil health. After this project and the additional mentorship from my advisor in executing this project I have become a passionate skeptic of soil management ideas that ‘just make sense’, I’ve gained an awareness of the language of marketing versus the language of empiricism. A soil and crop consultant in Colorado contacted me about this research in response to my sharing of some preliminary descriptions in an online community of practice. He is often approached by clients either wishing to use, or currently using, compost tea and compost extract. He had also recently purchased several kits of the Soil Microbiometer® system. It was very valuable to this consultant and his clients to know that this system does not yield comparable data to the microscopic assessment of liquid compost extracts. He was further inclined to manage clients expectations for plans involving compost teas and extracts, and design backup plans in the case that they did not deliver expected results. Future work with compost extracts and teas is certainly justified. The challenge is that progress and impact are hindered by the variability of composts and the range of purposes for use. Unfortunately, we cannot suggest the most useful test data that should be collected from compost extract when it is studied going forward. Based on our results in cucumber seedlings, it would certainly be an interesting question whether treated seedlings perform differently once transplanted to the field. Similar work is being done with a portion of the seeding mix substituted with worm casting compost. Most important of all will be to increase the volume of trials in real field settings that have been designed well. It seems that most published work with compost extract is in the laboratory or controlled environments. SARE is well positioned to support farmers who would like to run uncomplicated experiments on a broader scale.